Abraham ran at the Darlington mile race and did very well clocking 4:36 but only managing 4th in a strong line up. He said a lack of training and his lack of fitness meant he had no speed ! He did amazingly well and it is scary to think how fast he might be once his training and fitness are upped. Also performance of the day to Ria Chaston for a 2nd lady finish in the mixed 800m. I did it!!! I completed the London Marathon!! It didn’t exactly go to plan on the day, but I kind of expected that. I started off at the back of the red start and took about half an hour to cross the start line. I stopped for a wee within the first mile and though I should go a little bit quicker to make up the lost time and stick to the 4 mile per hour pace that I’d planned on. oh dear. It was going ok, I was managing to keep running at my preferred pace, then, before mile 4 the sweeper bus was upon me. For those who don’t know, there’s a bus that goes along the course picking up all of the injured and people dropping out along the way. Once these pass you, you’re supposed to get on the pavement if you insist on completing the race. The bus coming up against me so early in the course was such a big dent to my confidence, but I kept on going whilst panicking a bit. 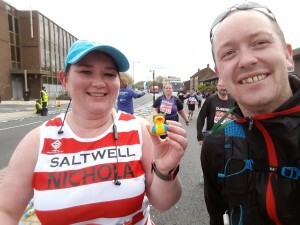 Just before mile 5 I bumped into Sarah North, Lee Nixon and Darren Wharton, had a quick chat and photo, then I pushed on ahead. I got talking to a few people along the way, people standing on the streets as we passed were shouting out names and encouragement, music playing everywhere etc, it was amazing. I was loving every second of it (apart from knowing those damn buses were right behind me) It was a bit weird being stuck behind a guy carrying a giant testicle for a few miles. I’d rather not be looking at that while I run thank you very much. I was passed by about 10 Rhino’s and all sorts of other fancy dress people. Once I got to the Cutty Sark, the amount of people, noise, cheering and seeing the first real attraction to get an idea of where I was , it was probably the biggest highlight of my run, I was feeling good, my pace was completely right and I wasn’t feeling any need to stop of slow down. On we went..
By the time I got to Tower bridge all of that good feeling was out of the window. Not only had the buses started to go past me, there were also tractors alongside me to clean the roads.Major panic hit me and I was fighting back tears while still trying to smile and thank people who were shouting my name for encouragement. Tower bridge should have been awesome, just coming around that corner and seeing the bridge in front of me was a big wow moment that was marred by stupid, stupid tractors. When you get to the end of tower bridge you have to turn right and you’re about half way (13 miles) but there are also runners going the other direction who are at about 22 miles. I’ve read about and heard people saying how daunting that part is, knowing you have miles to go and they’re already there, but I couldn’t actually imagine how that would feel (with tractors too). I saw Ian Swanston going past the other way (well he saw me and shouted) then Julie Sneider saw me and stopped for a hug. That just sent me over the edge and I burst into tears. I was thinking I might as well just give up, I wasn’t going to make it if they were already cleaning the roads around me. But Julie shouted at a couple of people going past the same way as me and asked them to stay with me, they were happy to (I think). Half a mile along the road my boyfriend, James, was standing waiting for me. I couldn’t run any more, I was too despondent by then, so he walked with me for a little while, then let me go on. I managed to stay alongside the tractors till about 15.5 miles, then they just sped off. The crowds were gone and it was just me and a few of the remaining walkers and lovely people who stayed to encourage us slowcoaches on. For the most part it was the same people around me most of the way, but i think we slowly started spreading out even more. I talked to one bloke who told me he had only done 2 miles in training! I wouldn’t have dared start if I’d only trained to 2 miles. As it was I trained to 20 with no problem, and that obviously wasn’t enough. It was amazingly lonely out there so every little cheer, chat, or even someone calling me Wally (grr) was welcome. I tried putting earphones in and listening to a podcast to make it feel more like it did in training, but I couldn’t really hear it. All I could do was keep putting one foot in front of the other and hope that I made it to the end in time to get a medal. So, off we went (not that I’d stopped) and soon got told we had to get off the road. They were cleaning the road more, taking down the signs and barriers and I was pretty worried we wouldn’t know where to go. We managed though. People kept getting in the way on the paths, but then when they saw my number and realised I was still doing the marathon, they would wish me luck and tell me to keep going. I must have had tears in my eyes every time someone said kind words. I was off crying again lol, we got to the sign that said something like 385 metres to the end, and I couldn’t see which way we needed to go so I stopped, still crying and not knowing where to go. We found gap to get onto the road on the mall with the finish just in front of us, and we sprinted (kinda) to the finish line hand in hand. We made it! I got a medal and a goodie bag, but no tshirt, they’d ran out. The relief of it all being over was amazing, I’m so glad I didn’t give up halfway like I’d thought about. So I can now say I completed a marathon!